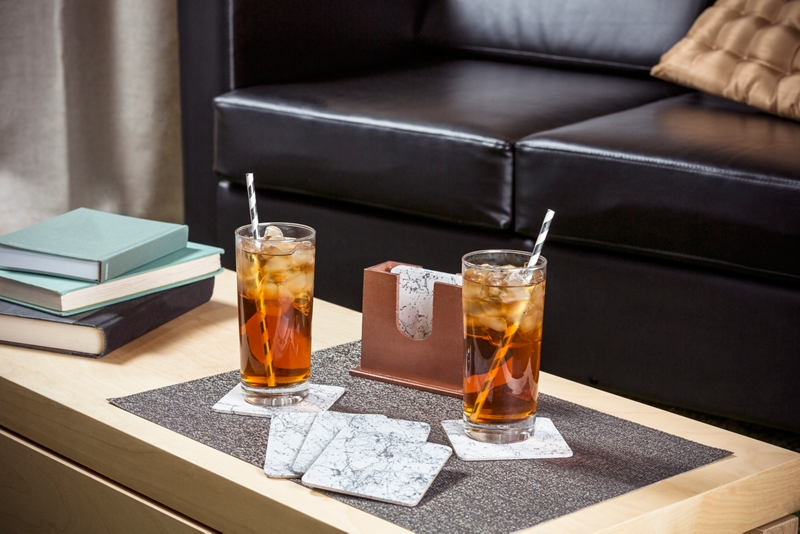 Create an on-trend faux marble and copper coaster set using Krylon®! Place coasters and coaster holder on a drop cloth or covered surface in a well ventilated area. Make sure all surfaces of the coaster set are clean, dry, and dull before applying spray paint. After reading the product label for proper application and safety instructions, spray the coasters using Krylon® ColorMaster™ Paint + Primer in Gloss White. Once completely dry, spray the top of the white coasters using Krylon® Marbelizing Spray in Silver Shiver. Once the Krylon® Marbelizing Spray has dried completely, apply light coats of Krylon® ColorMaster™ Paint + Primer Acrylic Crystal Clear Gloss. This will ensure a high-gloss, protective finish. To add a metallic touch to the project, spray the coaster holder with light even coats of Krylon® ColorMaster™ Paint + Primer in Metallic New Penny. Wait for the coaster holder to dry completely before placing the coasters inside.